Knee-Jerk or are you really worried? The final whistle went and the red half of Wembley all celebrated the first silverware in years, the atmosphere was brilliant and everyone was getting on! I still remember leaving Wembley and heading back to the Arsenal area for one of the best football related pub nights in years – it was a real party then went on well into the early hours. It was supposed to be a spring board for success – it signalled the end of the Emirates project (near enough) and the start of a new era. It started well, we all knew Fabianski and Sagna were leaving and were replaced and we recruited a world class star in Alexis Sanchez. The future looked bright…..
…Then the season began and safe to say; it hasn’t quite set off yet – we haven’t played very well and been rescued by Alexis Sanchez. The signing of Alexis has been stunning and many thought we had turned the corner – Ozil last summer, Sanchez this and ‘if we can add that holding midfielder we require and some cover in defence, we can challenge again’ – a few months on and we are still saying the same thing. The frustration comes because we feel we are quite close – if you look at Man Utd, Liverpool, Everton and Spurs all struggling, this was perhaps our chance to progress and maybe challenge Chelsea for the Premier League but it feels like we have missed our chance. Last season, despite us falling away in the league post February, the first half of the season was truly beautiful at times in the League. Despite losing against City and Utd away from home, we went to places like Swansea, Cardiff, West Ham, Palace and Newcastle and got the three points and we were flying at times. This season, every game has been a struggle bar Villa away (for three minutes anyway!). It would be too simplistic to say a holding midfielder or an additional centre back would have solved all our problems because they may not have but our squad would have been more complete and injuries at the back may have affected us far less. Even not allowing Carl Jenkinson to go out on loan would have helped the situation – I know I would rather have Jenkinson on the right and Chambers in the middle rather then Chambers on the right and Monreal in the middle. It’s also all too simplistic to say all our tactics are wrong because we saw Flamini stay tight to Sigurdsson and we kept him out the game quite well – a direct free kick is impossible, even for the best holding midfielders in the world! But overall, we seem to make the same mistakes over and over and when leading a game, our approach remains the same and this week has shown us that. I absolutely love Arsene Wenger and really believe that in years to come, keeping Arsenal in Europe and at the top of the League (top four) while moving stadiums will be considered one of the best footballing achievements ever. The problem is, I don’t see where the current team is going – injuries, loss of form, confidence & inability to defend (leads or at all sometimes!) are all problems that have not been rectified. Arsene will never buy a player for the sake of it or a player who he believes is not good enough to play for Arsenal and has often tried to ‘get by’ and hope we do not get injuries in key positions – that may be the problem. Even by getting an average centre back in this summer would have meant they would be playing ahead of Nacho Monreal (who is doing the best he can playing out of position). You cannot predict injuries and therefore even getting someone in or keeping Vermaelen (been injured most the season so far) may have meant we would still be in the position but that would be plain bad luck rather then plain bad planning. Let’s be honest, not many can see a change of manager to occur mid season so there ‘MUST’ be some short term measures taken to improve our form. We can pray for our best centre back to return but there seems to be more needed. Confidence needs to increase – a win against a Manchester Utd team who are not playing at the level they would want to be at too will help and just get the season back on track. Despite how even the most positive supporters are dreading the next game, if with a bit of a luck and quality, we could win a big game, we may finally put together a consistent run which is essential if we want to remain and get in to the top four/three/two. I love Arsene philosophy in terms of attacking football and despite our football not being there at the moment, we saw a glimpse when Sanchez rolled the ball to Welbeck who played a one two with Chamberlain in the box and forced a save from Fabianski at the end of the first half – that is what we want to see more. Surely the time has come to let Steve Bould really work with the defence and manage them a little – he deserves more responsibility and he may be able to work with the patched up defence and perhaps improve their performance by 10% which at the top of the game, can be the difference between winning and losing. It seems like we need to get through to January and try and remain near the top of the table then add to our squad and get injured players back and push in the second half of the season and see where we end up – even a quarter final in the Champions League would be nice for all supporters and especially those who like a good old European trip. Then in the summer, serious questions need to asked and as much as I love Arsene Wenger (and believe me, I really do) – he needs to decide what his own future holds, if to delegate more & allowing others to influence the team or go out and buy the world class players we need (potentially could happen in January but less likely) and we may finally see our great club playing and competing with the lights of Chelsea for the league. Let's face it, you are looking elsewhere, try to zip your jacket up and it gets stuck - I mean that is natural. 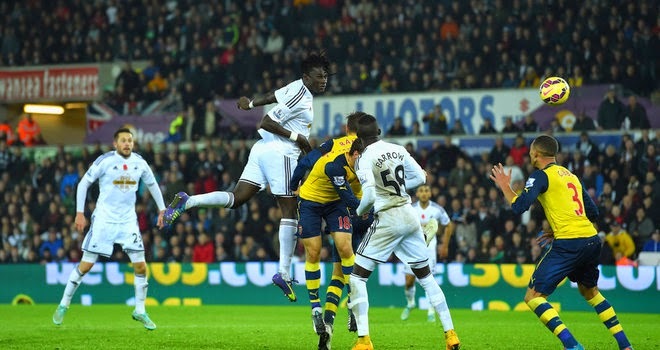 It may happen once, or maybe twice or at worst, three times - UNLESS you are Arsene Wenger. Every man and their dog has had a laugh at Arsene Wenger's jacket. It started when the TV camera's got wind of it and the jokes began. Even Ivan Gazidis had a laugh about it at one of his question and answer sessions with supporters. Club legends have all had a laugh and so have us, the fans. Many of which have gone to the club shop, just to try the jacket and take a photo. ...and now Arsene Wenger himself has got involved and has seen the funny side. 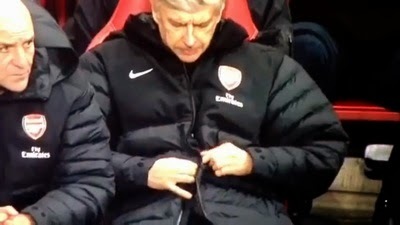 Long live Arsene Wenger's jacket!